If the pale pink blossoms of the tulip trees and the dark purple crocuses weren’t already announcing the arrival of spring, then the sight of people perched on low stone walls reading underneath a waning winter sun certainly will, letting me know that our neighbourhood is waking up from their winter slumbers. Today finds me watching an all ages, male and female rugby match at the edge of our urban forest after a savoury lunch of freshly cooked fish and chips. There are several eagles flying against the chalky blue sky and the sun feels warm on my exposed ankles, winter boots tucked away in anticipation of spring, sneakers and sandals having come out in their place. The shouts, scrum and kick of the ball a beautiful melody among many – the hum of float planes, bicycle bells ringing and children’s excited laughter. A wonderful tension exists in the air between seasons, there are still bare trees to behold inviting one to indulge in hot frothy drinks and enough new growth to usher in some white and green teas into the mix. My tea shelf is bursting with new spring flavours! On the first day of spring, a wander downtown to the Vancouver Art Gallery to spend some time among the paintings and sculptures of the French Moderns: Monet to Matisse, 1850-1950 exhibit left me yearning to sit in lush gardens, create still-life groupings upon my tables and find myself in a sultry olive garden reading a book. With over 60 paintings and sculptures to admire, another visit before it closes in May is definitely on my wish list. A few days later, the haunting lyrics to a song playing on a portable speaker attached to one of a pair of bikes belonging to a couple perched on a rock overlooking the ocean beseeched us all to do better. On my own walk down to the seawall rejoicing in the sound of the pounding waves, it gently reminded me to shake off the white noise of this busy world and make more time for active listening, more random acts of kindness, and love. This tickle of awareness sweetening each errand of the day, bathing each interaction in a warm glow. Later, on a walk to my favourite nook for a cloudy day creamy hot chocolate, I noticed heady floral notes of hyacinth and cherry blossom in the air, nudging out the winter scents that I love – the coming season, a brand new page, waiting for my ink and inspiration murmuring that beautiful refrain, we can do better. A stunning shot of those pale pink tulip tree blossoms captured in Stanley Park (Vancouver, B.C.). 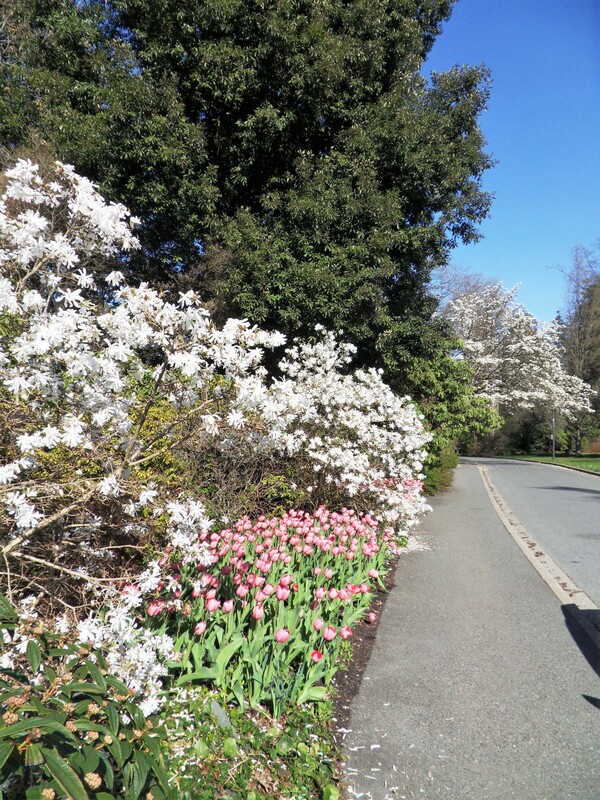 Spring is starting to decorate our favourite pathways! 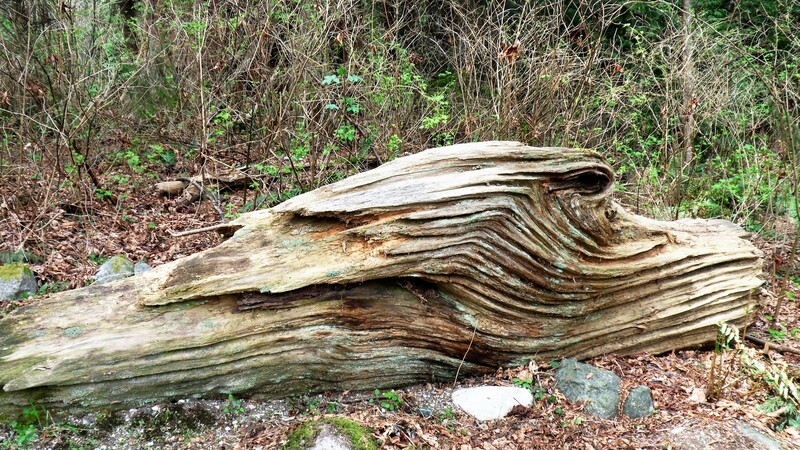 This natural cedar sculpture lies on a forest path just beyond the oval where we watched that exciting rugby game…it reminds me of an ancient dinosaur head still lying where it fell so long ago. This post is dedicated to the people of Paris, France as they mourn the tragic loss of the Notre – Dame Cathedral’s iconic spire and rooftop due to an unfortunate fire. This entry was posted in blog, journaling, life, memoir, photography, travel and tagged art, books, fragrance, ink, joy, love, Monet to Matisse, music, musings, nature, outside, rugby, Spring, wandering, writing. Bookmark the permalink. Thank you for such a lovely spring post. Thank you so much, Kat, for stopping by and leaving such a lovely comment! yes I can see the dinosaur … huge loss, fire can be so debilitating! Love your very restful and energising posts, your descriptive powers are exceptional, thank You! Terry took the picture and thinks it looks like a duck, Lol! Thank you so much for stopping by, your words never fail to bring a smile to my face! so very glad of that, you deserve to smile more! So my heart is with the world today with the fire in France. An icon, a look back into the past. Our march to triumph comes with comforting not only France, but comforting the homeless and helping others. I agree we can do better. I’m so glad I spent some time (long ago!) at the Strasbourg Cathedral and have a tattered souvenir booklet to peruse, the architecture is very similar to Notre-Dame…Huguette just sent some pictures of fires burning in Guadalajara, Mexico…it breaks our hearts to see history burning before our eyes and you’re right, these places, are our only paths left to the past. Thank you, Mom and hope you continue to feel better! Beautifully written. So wonderfully descriptive and so filled with wellbeing. Your beautiful words warm my heart! I try (always!) to infuse some wellbeing into my posts and I’m glad you felt this, thank you so much for letting me know. I love those tulip tree blossoms. They are not something we see here. It is wonderful to move into new seasons clothes and visit such amazing art. You are indeed blessed. Hi, Brigid! Those blossoms are so lush, they were captured by Terry at just the right time…cooler weather and rain are causing them to fall to the ground at the moment, reminding me of how fleeting spring is! Thank you for stopping by, I’m always happy to see your sunny icon! I’m a wee bit impatient for those languid days in the park, book in hand, but meanwhile I’m decluttering and organizing on days when the weather is frightful. Thank you so much for your lovely comment, it’s brightened one of those days! Thank you Kim for basking us in the mood of flavors and fragrances of spring💐Also .your words of comfort to the world are being embraced. Your words go straight to the heart. Thank you, Huguette! The photos you sent me of the fires in Guadalajara, Mexico are equally as frightening as the Notre-Dame fire…we are living in interesting times and have to stick together! My heart almost stopped when I saw pictures of the spire collapsing…it’s heartwarming to hear of its rebuilding, I’m sure it will be even more beautiful when it’s completed! Thank you so much for stopping by, Diana, I hope all is well with you and your parents…have they settled into their new home yet? Hi, Kim! How nice to read your lovely words today…I’m glad you enjoyed the journey! Thank you (always!) for stopping by, Mackenzie, your lovely words never fail to warm my heart! Such beautiful pictures. I think I would’ve loved to have been there to experience that rugby game and I definitely would’ve taken the time to go sit in the lush gardens that you were yearning to sit in. Your words really describe a vibrant spring and truly paint a colorful impression in my mind’s eye. 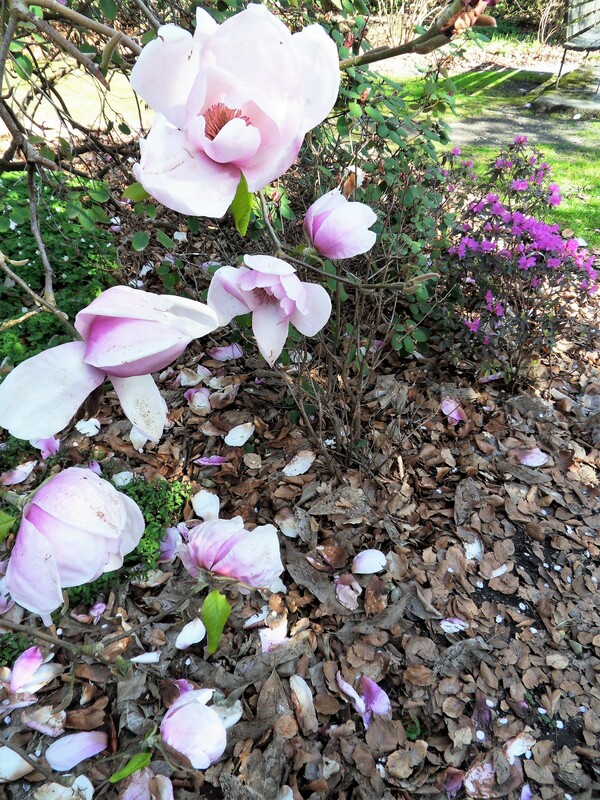 Thanks for sharing this Kimberlee, it’s a joy to experience the seasons through your eyes. Thank you so much, Mark! I’m so blessed to have such lovely readers…I live in a beautiful part of the world which makes it easy to share. Spring is such a beautiful season, and a lovely time for the soul to feel the colours of nature..
And Kim, I’d like to thank you for following my blog/website, muchly appreciated, I hope you enjoy reading my humble writings, and I’m from Geelong, Australia. Cheers. Ivor. Here is my favourite spring song. Thank you so much for stopping by and leaving your beautiful prose and song selection, I appreciate it a lot. Ivor! Beautiful spring! I love that natural cedar sculpture in particular! So lovely. The world has been holding Paris in its arms. I do hope the unrest there is settled soon and peacefully. Thank you so much for stopping by, I’m so glad you enjoyed this spring read, Luanne!